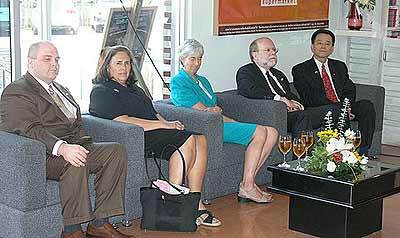 (seated left to right) US Agricultural Attaché Pickel Simer, US Commercial Consul Ann Bacher, US Consul General Bea Camp, US Ambassador Ralph Boyce with Khun Warakorn Tantranont, owner of Rimping. Rimping Supermarkets in Chiang Mai recently welcomed the US Ambassador to Thailand, Ralph Boyce, who inaugurated the launch of American food products at Rimping City Daily location. This promotion includes American wines, fruits and other products that will be available until July 10th. .
At the Writers Club book launch last week-end l/r Karen Baker, Doris Kraushaar, Christina Nadasi, Robyn Brown and Chris Brown. 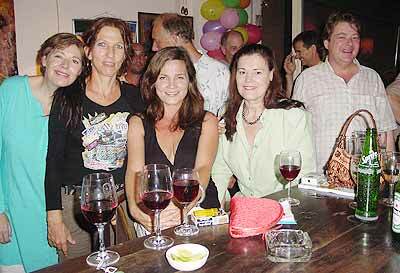 Andrews is the author of the successful spoof “Boom Boom Baby” celebrated the launch with more than 60 guests from Chiang Mai’s media scene. Violinist Qiang Xiaoxiao, cellist Ekachai Maskulrat and pianist Christopher McKiggin will perform Thursday, 28 June at 19:30 at the AUA Chiangmai. On the program are compositions by Beethoven (Piano Trio No.5), Kiangsiri (Violin Sonata), Silsupan (Kreting Saam) and Shostakovitch (Piano Trio No.2). Qiang Xiaoxiao studies violin with Qian Zhou at Yong Siew Toh Conservatory of Music in Singapore. She won many awards including 1st Prize in Guang Dong Violin competition. She was a member of the China Youth Orchestra. Ekachai Maskulrat is studying cello with Qin Li Wei, also at the Yong Siew Toh Conservatory of Music in Singapore. Of the many awards he has won includes 1st prize in the Thailand String Competition. He played Elgar’s Cello Concerto with the Bangkok Symphony Orchestra in February 2007. Christopher McKiggan, whom some may have met before, playing the harpsichord at the “Baroque Evening” at Gong Dee Studio, studies piano with Dr.Robert Weirich at the University of Missouri, USA. He won the Gold Medal in the Thailand National Youth Music Competition, and many other prizes. Thatchatham Silsupan is studying composition with Assoc. Prof. Ho Chee Kong at Yong Siew Toh Conservatory of Music in Singapore. He was a finalist for the Young Thai Artist Award 2006. Pantawit Kiangsiri studies composition at San Fransisco Conservatory of Music at USA. His teachers are Conrad Susa and David Garner. To celebrate a mural restoration project funded by the Ambassador’s Fund for Cultural Preservation, Ambassador Ralph L. Boyce and staff of the U.S. Embassy and U.S. 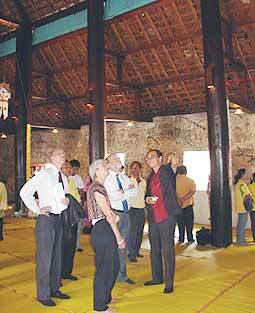 Ambassador Boyce accompanied by US Consul General in Chiang Mai, Bea Camp, view the completion of the US funded restoration project at Wat Baan Koh. Consulate General Chiang Mai joined ceremonies earlier this month to mark the completion of the project at Wat Baan Koh in Lampang. In his remarks delivered in Thai, Amb. Boyce expressed his appreciation of Wat Baan Koh as “a wonderful example of Thailand’s cultural rural heritage” and his hope that the restoration would serve as a model for others. After the ceremonies he visited the Wat Baan Koh school and spoke with students there. The Ambassador’s Fund was established by Congress in 2001 to support efforts to rescue cultural heritage that is fragile or in danger of being lost forever. The Fund has also supported preservation efforts at the Kamthieng House at the Siam Society in Bangkok, the antique textile collection at the National Museum, traditional Thai textile patterns from the south and northeastern Thailand, Thailand’s Islamic architecture through a digital database, and prehistoric rock shelters in Mae Hong Son province. The staff of the U.S. Consulate General invites American citizens in Chiang Mai to celebrate the Fourth of July on Wednesday, July 4, from 4 to 8 p.m. The celebration on the lawn of the Consulate will feature a variety of entertainment, good ol’ American hotdogs and soft drinks, and a watermelon eating contest – capped off with a fireworks display at 8 p.m.
All participants will be asked to show either a U.S. passport or a photocopy of the passport to enter. Admission is 50 baht. Children 12 and under are free; they must also show a U.S. passport or copy. The public gate across from the Municipal Office will open at 4 p.m. with no further admissions after 7 p.m. To expedite entrance, please don’t bring bulky items. This information is also available on a recorded announcement at 053-252-629, and on the Consulate website. The guest must arrive with the American citizen host and bring a printed copy of the e-mail confirmation received from the Consulate, as well as a photo ID. To avoid overcrowding, we are unable to accommodate more than one guest, adult or child, per American citizen. On the International Day against Drug Abuse and Illicit Drug Trafficking, 26 June, the monthly NGO Forum invites civil society groups and government representatives to join a discussion on comprehensive health and social care service delivery for drug users. This month’s Forum will explore the drug situation in Thailand and set the stage for future discussions on Northern Thailand where, in the next six months, many health and social outreach services for drug users will be terminated because of financial cutbacks from donors. The Forum will also address the impact of Thailand’s policy on drug users and bring potential advocacy solutions to the fore for greater discussion and consideration. A recovering drug user will share her experiences with participants and explore how the evolving situation is likely to affect drug users. An open discussion will follow with main speakers: Dr. Apinun Aramrattana, Deputy Director of the Research Institute for Health Sciences at Chiang Mai University; Mr. Nantapol Cheunchooklin, ex Chairperson for the Thai Drug Users’ Network; Mr. Pascal Tanguay, Information Officer at the Asian Harm Reduction Network; Piyakran Kittiborrisut, a representative from the drug user community; Ms. Umaporn Petchlim from AHRN and Ms. Sivalee Kasemsilpa in her role as the THRN Coordinator will moderate the discussion following the presentations.